CNN) — Amnesty International has accused Hamas militants in Gaza of kidnapping, killing and torturing fellow Palestinians they accuse of spying for Israel, the organization announced Tuesday. 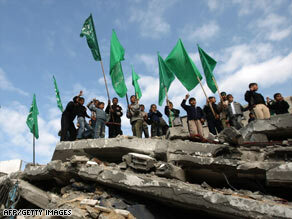 Hamas supporters stand on the rubble of a building hit by an Israeli strike that killed Hamas’ interior minister. According to Amnesty International, at least 24 Palestinian men — most of them civilians — were shot and killed by Hamas gunmen during the recent Israeli offensive aimed at crippling the Hamas leadership in Gaza. “Scores of others have been shot in the legs, kneecapped or inflicted with other injuries intended to cause permanent disability,” the human rights organization said in a news release. Hamas leaders have publicly accused followers of its rival Palestinian political faction, Fatah, of spying for the Israelis during the conflict, and they have said many have been arrested for collaborating with the Jewish state. But they deny ordering any reprisal attacks against suspected spies, instead blaming rogue elements. The Israeli military offensive in Gaza was launched at the end of December and ended three weeks later, when Israeli forces withdrew under the terms of a cease-fire agreement. Amnesty said that the targets of “Hamas’ deadly campaign” include prisoners who escaped from Gaza’s central prison when Israeli forces bombed it in the initial days of the military conflict. Some prisoners injured in the Israeli bombing were “shot dead in the hospitals where they were receiving treatment,” Amnesty said. “The perpetrators of these attacks did not conceal their weapons or keep a low profile, but, on the contrary, behaved in a carefree and confident — almost ostentatious — manner,” it said. Other targets included former members of Palestinian Authority security forces and supporters of Palestinian Authority President Mahmoud Abbas’ Fatah party. Fatah, which is based in the West Bank, has denied spying on Hamas. Fatah leaders have accused Hamas of rounding up at least 175 of their members in Gaza during the Israeli war and torturing them. The two Palestinian factions have been locked in a power struggle since Hamas won parliamentary elections in January 2006 and wrested Gaza from Fatah in violent clashes the following year. Abbas is a U.S. ally and regularly negotiates with Israel as the Palestinian leader, but he holds little sway in Gaza. Fatah supporters have been accused of helping the Israeli military conduct its campaign in Gaza, which targeted the Hamas leadership. Neighbors of Hamas Interior Minister Said Siam said they suspected Fatah supporters helped Israel pinpoint his location when they bombed his house on January 15. Siam was highest-ranking Hamas member killed in the Israeli offensive. Most of those suspected of spying for Israel have been abducted from their homes and then “dumped — dead or injured — in isolated areas,” according to Amnesty International. During the Gaza conflict, medical officials at Gaza City’s main medical facility, Shifa Hospital, said injuries they witnessed were consistent with people being shot in the kneecaps, elbows, hands or feet. Punishment shootings are a time-tested tactic used worldwide by guerrilla and militia groups, from Che Guevara in Cuba to the Irish Republican Army in Northern Ireland. They are meant not only to take revenge but also to send a message to others. Two self-described Fatah loyalists were found heavily bandaged at a Gaza City safe house during the recent conflict. One of their colleagues refused to say where or why they were injured, but they denied spying.